Gabi’s fight against 53-year-old Shinobu Kandori was scheduled at Rizin’s Federation show in Saitama, Japan and caused a controversy yesterday as she severely missed weight by 26 pounds after agreeing to a limit of 209.4 pounds- she tipped the scales at 107.7 kg (236.94 lbs). An opponent, Kandori felt disrespected and lost it in front of media before storming off the stage. Rizin official Nobuyuki Sakakibara spoke about possibly canceling the contest, but no official announcement has been made as of now. Last night Garcia was forced to step in the ring inside Saitama Super Arena in Saitama, Japan, where she apologized for being missed the weight for her bout against 53-year-old Kandori, which was scheduled for 209 pounds. The entire show stopped as Garcia, breaks down, plead the Japanese people to forgive her. Gabi was addressing the RIZIN crowd. Even Kandori and head official spoke to the crowd. Kandori insisted that she would still like to fight Garcia. “I’m talking fast, I just say sorry about this,” Garcia said. “It’s first time this happened in my life, but (I had problems) three weeks before the fight and I think I recover and my first training here, my nose is with blood and my blood pressure, I know (I had problems cutting weight). “Everyone is looking for an excuse, but when it comes to health and our lives, they can say it’s anything. My life first. Unfortunately a few days ago I measured my pressure and was high, I thought it was only that day. When I got off the plane in Japan I went to my training and started to have a headache, my eyesight blurred and my nose bleeding all the time. I warned my team, but I did not tell anyone because I did not give up. After all my training, my nose was bleeding from leaving a towel next to it. It was fine the night before and I decided to cut the weight the next morning, but I woke up with fever and again with my nose dripping, high blood pressure. Too much stress before traveling, unfortunately I still do not control my body, but I control my decisions. For those who have lost a brother, dying for a cut of weight would not be my choice. All together, menstrual period, high blood pressure, it was necessary to cut 17 pounds. I chose to live. No need to post any explanation, but no one knows what people are going through. 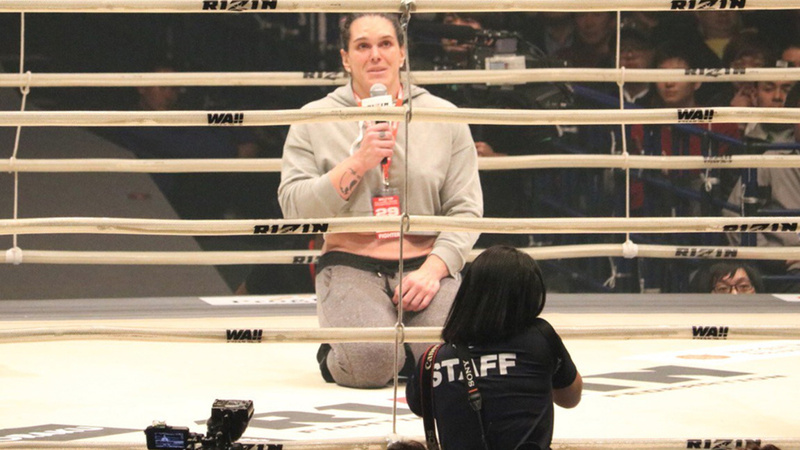 She seemed genuinely upset at what happened and apologized to her opponent, employers, and the Japanese fight fans.